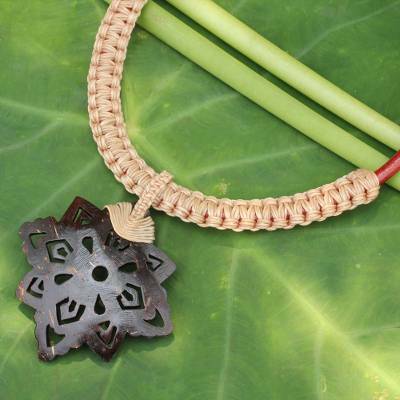 Thai Leather Necklace with Coconut Shell Flower Pendant, "Floral Tan"
Like a florid mosaic, the coconut shell pendant on this necklace is fascinating. Sasithon Saisuk surrounds the pendant with tan macramé at the center of a handcrafted brown leather necklace. You can find leather and coconut shell flower necklace 'Floral Tan' by Sasithon Saisuk in jewelry categories such as Floral Necklaces, No Stone Necklaces, Coconut Shell Necklaces, Polyester Necklaces, Leather Necklaces and Pendant Necklaces. Enjoy exploring these sections for other Novica treasures.